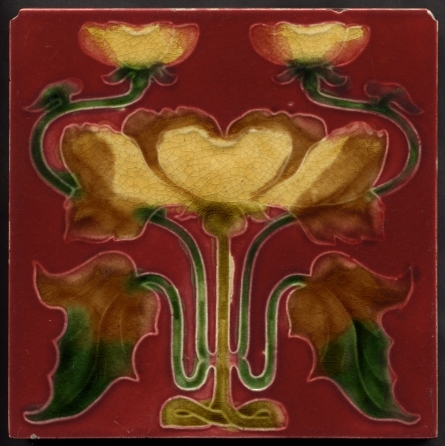 A characteristic art nouveau design filling the tile with flowing forms. It is a design that we see quite often but rarely in these colours. Red was a problematic colour tending to bleed in to and react with adjoining colours and apparently causing other problems in the kiln, it was more expensive, even plain red tiles were more expensive than the majority of colours. Nearly all manufacturers of this period had some tiles that suffered to some extent with reds but Boote often seemed to have more problems than most. These red tiles are good in general and especially good considering the complexity of the painting required and for Boote. Top corners cropped for the original installation, small chip bottom edge - other marks to the egdes are manufacturing imperfections. a little scuffing to high points and other minor surface marks, clean and bright. The image is full size at 72 dpi (about 430 pixels wide) in maximum quality JPEG format. To see current dollar price and convert price to other currencies try this Universal Currency Converter.